Apple on Tuesday released an updated line of its MacBook Pro portable computers, adding in faster processors, new graphics chips, and a longer-lasting battery. 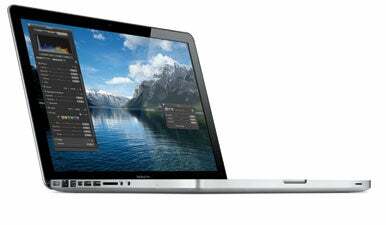 The 15-inch and 17-inch MacBook Pros saw the biggest jumps, as they now use Intel’s Core i5 and i7 processors. Designed with a 32-nanometer process, the Core i5 and i7 sport integrated memory controllers and Level 3 caches. A Turbo Boost feature lets the dual processor cores optimize their performance, allowing speeds of up to 3.06GHz for dual core tasks, and 3.33GHz for tasks involving just one core. As with the previous iterations, both the 15-inch and 17-inch MacBook Pro models feature two graphics processors, in this case the Nvidia GeForce GT330M for high-performance needs and the Intel HD graphics for more power efficiency. And in an improvement over the last generation, Apple says the system will automatically figure out which graphics processor is needed for a program or operation, and switch as necessary to give you both the best in performance and battery life. In the past you had to go into System Preferences, choose a graphics option, and log out and back in for the change to take effect. “We wanted to make the process much more seamless for the user,” a representative told us during a briefing on the Apple campus Tuesday. To that end, the company made it so the Macs intelligently switch between integrated and discrete graphics as needed. Apple also made the point that the company isn’t using Nvidia’s Optimus technology for graphics switching, but rather an Apple-developed technology. Unlike Optimus, Apple said, the MacBook Pro looks for frameworks needed by individual apps at launch (such as OpenGL and Core Animation) to decide when to switch, rather than looking at a specific list of applications. If you’ve been checking your e-mail, surfing the Web, or even watching 720p HD video in iTunes (none of which requires dedicated graphics) and launch Aperture, for example, the MacBook Pro will automatically switch to the GeForce dedicated graphics for all of your work until you quit that app. Pricing has shifted somewhat on the MacBook Pro line as well: while the lowest 15-inch configuration is now $100 more expensive than its predecessor, the top 15-inch model now costs $100 less. And the 17-inch MacBook Pro now sells for $200 less than before. Meanwhile, the 13-inch MacBook Pro now has faster Core 2 Duo processors, 4GB of RAM, and Nvidia’s new GeForce 320M integrated graphics processor. Fans of swappable batteries may shed a tear, as the 13-inch’s battery is now built-in—that said, Apple’s claiming 10 hours of battery life, which is a pretty solid tradeoff. Batteries can be replaced by Apple Authorized service providers: it’s $129 for the 13-inch or 15-inch models and $179 for the 17-inch model, including disposal of the old battery and installation of the new one. Battery life in general is also a focus of the line. The 15-inch and 17-inch models can supposedly run for 8 to 9 hours, thanks to highly tweaked power management. From an efficiency standpoint, all Mac notebooks meet Energy Star 5.0 requirements and achieve EPEAT Gold Status. The trackpad on the new MacBook Pros also supports inertial scrolling, which Apple describes as an intuitive way to scroll through large documents and photo libraries. All models feature a 1066MHz front-side bus, 4GB of 1066 MHz DDR3 SDRAM (expandable to 8GB), LED-backlit displays, a slot-load 8x SuperDrive, AirPort Extreme 802.11n wireless networking, Bluetooth 2.1+EDR, iSight video camera, Multi-Touch trackpad, and illuminated keyboard. The 13-inch is available in two configurations: a 2.4GHz model with a 250GB hard drive for $1,199 and a 2.66GHz model for $1,499. Ports include a Mini DisplayPort video out, two USB 2.0 ports, a FireWire 800 port, an SD card slot, and combined analog/digital headphone and line in jack. The display boasts a resolution of 1280 by 800, and is available only in a glossy option; build-to-order options include a 320GB or 500GB hard drive, both running at 5400 rpm. There are three 15-inch MacBook Pro configurations: a $1,799 model with a 2.4GHz Core i5 processor and 320GB hard drive, a 2.53GHz Core i5 and a 500GB hard drive for $1,999, and a 2.66GHz Core i7 with 500GB hard drive, for $2,199. All have both the integrated Intel HD graphics and the Nvidia GeForce GT 330M discrete graphics chip with 256MB of VRAM and a 1440 by 900 glossy display. In terms of ports, they included Gigabit Ethernet, two USB 2.0 ports, one FireWire 800 port, an SD card slot, audio line in (analog/digital), and audio line out/headphone (analog digital). The 15-inch build-to-order options include a 15-inch 1680 by 1050 high-resolution display available in both glossy and antiglare options. The top of the line 17-inch model comes in a single configuration with a 2.53GHz Core i5 processor, a 500GB hard drive, 1920 by 1200 glossy display, and both integrated Intel HD Graphics and the Nvidia GeForce GT 330M processor with 512MB of VRAM. It sports three USB 2.0 ports, a FireWire 800 port, an ExpressCard/34 expansion slot, and separate audio line in and audio line out/headphone jacks. The 17-inch model’s build-to-order options include a 2.66GHz Core i7 processor, a 500GB 7200rpm hard drive, and an antiglare display. Build-to-order options across all models include upgrading to 8GB of RAM; adding a 128GB, 256GB, or 512GB solid state drive; the Apple remote; and mini DisplayPort adapters for DVI, VGA, or Dual-Link DVI. Updated 7:24 PT with details on pricing versus earlier models. Updated 10:25 PT with details from briefing with Apple.